New & Just in Time For Summer! The final week of spring break is here, save for our friends in Louisiana who will be here some in April. We couldn’t ask for better weather either; with bright blue skies, warm sunshine, and temperatures in the mid-70s, we’ve got summer on the brain. What better time to begin planning your summer vacation in Destin, Florida? Our lodging partners Southern Vacation Rentals have recently acquired some beautiful new vacation homes in Destin, Florida that are perfect for your summer vacation. These three homes listed below were designed to help you make the most of any trip to the Gulf Coast. Be sure to call or book online when you’re ready to plan your summer vacation in Destin, Florida. Our Piece of Paradise is your piece of paradise! We love this four-bedroom home in the Destiny West neighborhood for many reasons, including the large screened-in porch and gourmet kitchen. A large granite breakfast bar, designer tile backsplash, and stainless steel appliances – what more could you ask for? Our Piece of Paradise accommodates 10 guests and offers you access to amenities including a pool, hot tub, fitness center, and tennis courts. 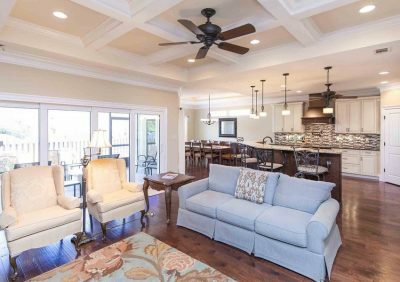 Another four-bedroom home that’s just the right size for 10 guests, Sea-Esta is located in Destin’s Leisure Bay neighborhood. Bright coastal decor serves as a reminder that you’re in for a treat at the beach! The bunk room on the second floor is perfect for any kids in your group. Find beach access just a mile away at Pompano Joe’s or splash around in the community pool. Like Our Piece of Paradise and Sea-Esta, Summer Lovin is another four-bedroom home we can’t get enough of, but it sleeps 14 instead of 10. The first-floor bunk room has twin/full bunk beds that we think the kids in your group will love! This home is located in the Dunes of Destiny neighborhood, with private beach access and community amenities waiting for you.